A street vender unfolds pages of a calendar featuring Myanmar's opposition leader Aung San Suu Kyi in a Yangon street, Myanmar, Nov. 12, 2015. With results continuing to trickle in, opposition leader Aung San Suu Kyi and her National League for Democracy appear headed for a landslide victory. U.S. President Barack Obama has congratulated Myanmar President Thein Sein for his country's "historic free and fair elections," according to officials in Myanmar, also known as Burma. Obama communicated the message during a Wednesday phone call with his Myanmar counterpart, Information Minister Ye Htut said on his Facebook page Thursday. The White House has not released a statement on the phone call, but U.S. officials have previously called the Sunday vote a "step forward" for the Southeast Asian nation. With results continuing to trickle in, opposition leader Aung San Suu Kyi and her National League for Democracy (NLD) appear headed for a landslide victory. The current government, led by the military-backed Union Solidarity and Development Party (USDP), continues to gives signs that it will respect the outcome of the vote. The NLD said Wednesday it received a promise on behalf of Thein Sein that "the government will pursue a peaceful transfer" of power once the NLD victory is confirmed. Myanmar's powerful army, which still wields enormous political control, has also hinted it will respect the results. "[Myanmar's armed forces] will do what is best in cooperation with the new government during the post-election period," said senior Myanmar army General Min Aung Hlaing in a Facebook statement. Under the 2008 constitution, the military automatically controls 25 percent of all parliamentary seats, and maintains control of several key government posts, including defense, interior and border security. The latest results from the country's Union Election Commission show the NLD has claimed 196 out of 243 seats, or more than 80 percent of the results announced so far for the lower house of parliament. The NLD is also far ahead in the upper chamber of parliament, winning 95 of the 116 seats announced so far. Aung San Suu Kyi, who won re-election to her lower house seat in Kawhmu constituency in Yangon state, will now be the leader of what is set to become the ruling party, even though the constitution bars her from the presidency. FILE - Volunteers count votes at a polling station during Myanmar general elections in central Yangon, Nov. 8, 2015. However, she has recently expressed a desire to become the country's de facto leader. In an interview with the BBC Tuesday, she insisted that she will continue to make all decisions as NLD leader, regardless of who emerges as president. The 70-year-old democracy icon is constitutionally barred from becoming president, because her late husband was British, as are her two children. 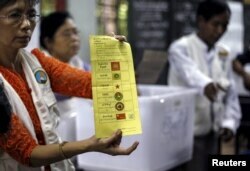 This was the first election in Myanmar since the military junta established a quasi-civilian government in 2011, after nearly 50 years in power, and one year after Aung San Suu Kyi's nearly two-decade long house detention ended and a ban on her NLD party was lifted.